Pull the release lever under the dash panel in the direction of the arrow 1 » Fig. 124. Before opening the bonnet, ensure that the arms of the windscreen wipers are correctly in place against the windscreen otherwise the paintwork could be damaged. Press the release lever in the direction of the arrow 2 and the bonnet is unlocked. Grab hold of the bonnet and lift. Take the bonnet prop out of its bracket and secure the opened bonnet by inserting the end of the prop in the opening 3 » Fig. 125 provided. 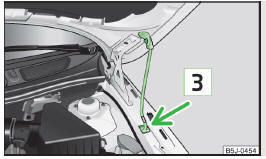 Lift the bonnet slightly and unhook the bonnet support. Press the bonnet prop into the bracket provided. Let the bonnet drop into the lock carrier lock from a height of around 20 cm – do not push it in. Check that the bonnet is closed properly.